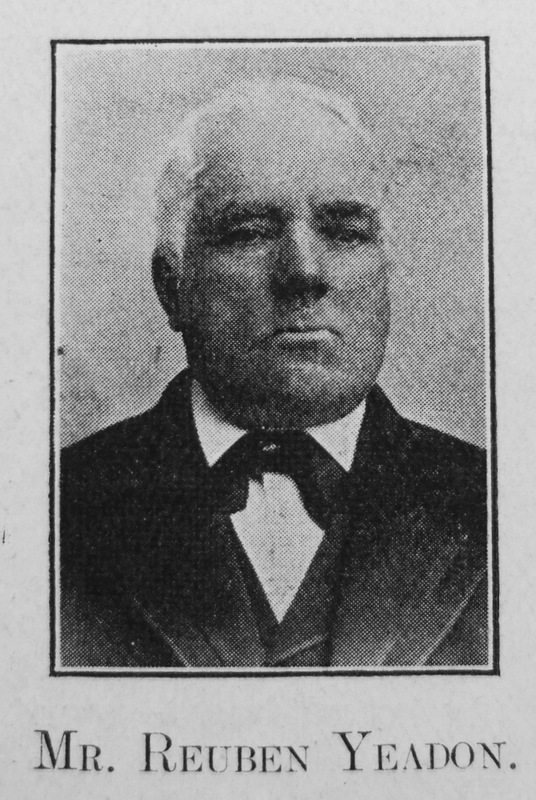 Reuben Yeadon was a native of Yeadon, a parish and Urban District which bears his own name. Not only so, but his father and mother were also “real Yeadoners,” in a double sense. Indeed, our brother spent his whole life of 73 years here except a brief space in which he took a leisure trip to Australia, which country part of his family had successfully adopted. At the age of seven years he went to work in a mill, at thirteen he was left an orphan with a younger sister to maintain out of his scanty earnings – a task he honourably and cheerfully accomplished. When he married and formed a home of his own, it was, in his own words, “in the least house in Yeadon – the ‘Salt-pie,’ by the football.” But the Divine blessing rested upon his home and business, and age found him in very ample circumstances. He was very happy in his domestic relations. His wife was a Christian of a high standard, and they lived together long enough to celebrate their “Golden Wedding ” among a crowd of friends and showers of good wishes and presents. Some two years followed this happy event, then the severance came, the death of Mrs. Yeadon preceding his own by about a year and a half. As a boy he began attendance at a Sunday School on premises which were at a later date handed over to our Church. His education was the development of gleanings picked up in this Sunday School. At the age of eighteen he became a seat-holder and could speak of his “family pew ” before he was married. About the same time he took his place on the preachers’ entertainment plan, and never ceased to “take the preachers ” until death removed him. He was full of anecdotes of Harvey Leigh, Christopher Hallam, John Harvey, H. Crabtree, Alex. McKechnie and others who had been among his earlier guests. When in his characteristic anecdotal mood, his company was an uncommon treat. He held every office and honour his Church had to give him. He has served as Sunday School Teacher, Superintendent, Class Leader, Steward, Trustee, Local Preacher, Delegate to District Meeting, also to Conference. For 52 years he was associated with the local Oddfellows Lodge, for many years he was Overseer for his parish, he served three terms on the Local Board, then as Chairman of the District Council, had a place on the magisterial bench of Otley Petty Sessions. His fidelity to duty will be seen in the fact, that he was not absent from the latter during fifty-two successive weeks. Testimony is repeatedly given to the good service he rendered as a Lay Preacher. The long distances he travelled, his devotedness to his work, and his terse practical way of sending his message home, are each matters of special comment by several whose fullest work was contemporary with his own. “It was his plainness of speech, his common sense, his thorough naturalness, his sincerity as a religious man, that gave him the respect he had as a local preacher,” asserted the Rev. H. Cooke on the occasion of his interment. The last few years of his life were spent in comparative quiet and retirement. His favourite haunts were the fields and lanes, his chief employment the study of his daily paper and his Bible. The chances of a Parliamentary election, or the progress of a religious revival were matters that interested and excited him up to the last. The last time he left his home was to attend the funeral of a friend, to which he went in a cab. But the pinching cold took effect on him to such an extent that he could not leave the vehicle, and so returned home to leave it no more. Apart from one or two animated conversations respecting “the cause at the Chapel,” little troubled or engaged him. His decease took place December 18th, 1903. His remains lie near the entrance of the chapel with which he was identified without break for 57 years. Reuben’s father was John Yeadon, a clothier. Census returns identify the following occupations for Reuben. Reuben married Elizabeth Dixon (abt1831-1902) in the summer of 1850 at Yeadon, Yorkshire. Census returns identify five children.